Here you can find the technical and hospitality rider for a Jazzcode Talk. Please observe that the specifications might be changed or modified. Call Carl at +4792280846 for more information if you are unsure of the specs for your performance. Download the most recent specification here. Once it gets closer to the performance and you know the spesifics of your arrangment, please fill in this form to make sure we have all the production details such as get-in times, sound check, performance times, contacts, hospitality etc. THIS SAVES US ALL TIME AND CONFUSION. 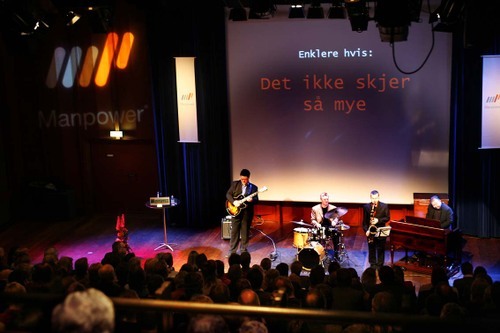 The JazzCode is a 45-90 minute concert combined with a lecture. Four jazz musicians are on stage — usually upright bass, tenor sax, drums and either piano/guitar/organ. Carl Stormer, the drummer, is also a business speaker. He both speak and play with the band. The stage must be big enough to fit both four musicians without the musicians interfering with the powerpoints being projected on the wall behind the stage (For audiences in excess of 35 people, a stage, min. size 5m x3m x 0.3m (W x D x H) should be provided). A powerful projector (min. 2000 AnsiLumen) with a cable that enables him to project images from his own laptop. He prefers to have his own laptop facing him on stage and 1xA/C power to run his PC for the duration of the show. One or more big screen(s). He also need a big canvas/screen (min. 320x280cm (WxH)) on the wall behind him or to the side in order for the audience to see the projections. Preferably, the projection should be approx. 4-5 feet (1.5 meter) above the floor in order for the musicians to be seated in front of the projection. If this is not possible, then either a) the stage must be able to fit both the band and the projection or b) the screen should be placed on one or both sides of the stage. Drinking water. Preferably several bottles of bottled, cold water (no gas). 2 Music stands of professional quality — with lighting if required. A small table or flight case next to the drum kit to place water, remote, and sticks during the performance. 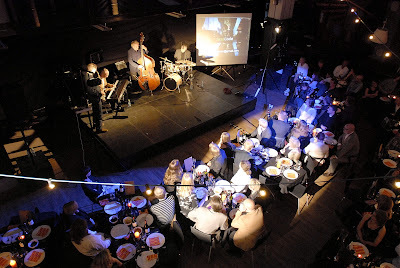 When the band plays for more than 60 people, they will need a public announcement system (“PA”) and a soundperson used to accoustic jazz (present both during sound-check and performance). Regardless of audience size, we need professional lighting. If a PA is needed, the following should be provided. 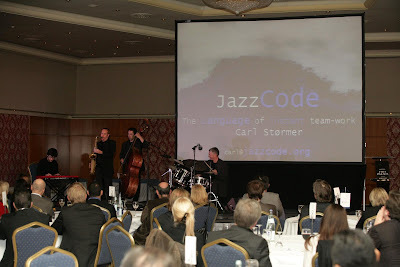 Questions about the PA can be directed to JazzCode’s principal, Carl Stormer at jazzcode.com Tel +47 92280846 or JazzCode’s production manager, producer at jazzcode.com. High quality sound system of well known brands like: EAW, Meyer, Nexo, L’Acoustics, Martin, Adamson, D&B, or Turbosound. The system should be able to produce 112 db (A) full-range sound pressure level without distortion at the FOH mix position. It should provide the greatest possible coverage of the entire audience – including balconies. The system should be checked to have correct matching polarity and phase throughout. High quality mixing console, min. 16 channels with 4 band sweepable parametric EQ per channels (Allen & Heath, Mackie are usually not suitable). Outboard and effects: Minimum 1 x digital reverb, e.g. Leixicon PCM-91. Four monitors — one for each of the musicians on four separate mixes. An accoustic piano unless otherwise specified in the contact. This needs to be tuned on the day of the concert and must be in good professional working order. If an accoustic piano can not be obtained, then an electric piano must be rented instead. The el-piano must have full size weighted action keys such as Nordlead Stage 88, Roland Korg Yamaha or Kurzweil weighted 88 note keyboard with sampled grand piano and a combo-amplifier (Fender Twin, Roland KB 300 or similar). For guitar: If a guitar player is brought in, a guitar amplifier must be provided (Fender Twin or similar). Upright Bass. Line out from the bass to the PA. Unless otherwise agreed to, a small bass-amplifier must be provided (Gallen Kruger, Eden, SWR or similar). Sax. The saxophonist will bring his own instrument. Will need a music stand. Drums. If the gig is taking place outside Oslo, Norway, the Client must rent drums. This can be handled by JazzCode, but must be paid for by the Client. A four-piece jazz set with all stands and a solid rug underneath must be obtained. Drum sizes: 18″, 14″, 12″ + snare drum. Stormer will bring his own sticks and cymbals (2 ride). Power — minumum requirements. The amount of power needed is highly dependent on the size and scope of the PA and lights. The size and scope of the stage depends highly on the venue and number of participants. Please review with JazzCode’s production manager. Minimum four spots, 750W (two on each stand, 2 stl, 2 str), dimmer-controlled four spots. JazzCode will need to finish soundcheck no later than 30 minutes before the performance. The soundcheck takes no more than 60 minutes provided that the PA and sound person is done with their rigging. During the soun-check, the Client must ensure that next-door neighbors can tolerate the sound generated by the sound-check. A minimum of 2 x people available to carry equipment before and during sound-check and after completion of the performance. The Client must provide a separate room where JazzCode personell may change clothes, warm up and lock their valuables before, during and after the performance. This room should be lockeable. The Client must inform JazzCode if the room for any reason is not secure during the performance. In the dressing room, the client will provide food (sandwiches and snack) and plenty of coffe, milk, sugar, tea, bottled water — mineral and still — for up to six JazzCode personell. JazzCode may bring two assistants to the venue who will also be able to be present during the performance. Guest list. Jazzcode may invite a limited number of guests to overview the performance. These guests will leave the venue after Jazzcode´s show is finished. An almost perfect setting: Musicians are well lit, and the projected image is still seen by all. Even better if the lower part of the projected image was not lit up by the lighting and if the screen was not partially behind the musicians. .
BAD LIGHTING: Notice how lighting is insufficient on this event; daylight makes it hard for the audience to see the projected image on the screen; and the musicians are not highlighted at all. BAD LIGHTNING: Notice how the lighting is making it hard for the audience to read the projected image on the screen.